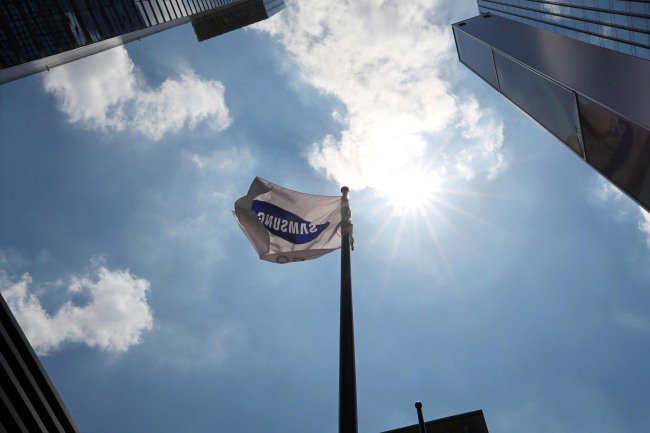 Samsung Electronics reported a 4.9 percent decrease in operating profit in the April-June period from the previous quarter, largely due to a decline in sales and profit from the smartphone business, according to the company’s earnings announcement on Tuesday. It puts an end to the South Korean tech giant‘s longest-ever streak of all-time-high profits -- six quarters -- but the figure is still an increase on the second quarter operating profit of 2017. Samsung posted 58.48 trillion won ($52.2 billion) in consolidated quarterly sales, down 4 percent from a year earlier, and 14.87 trillion won in quarterly operating profit, up 6 percent over the same period. Second-quarter sales fell due to lower sales of smartphones and display panels despite robust demand for memory chips, the company noted. The IT and mobile communications division posted 24 trillion won in sales and 2.67 trillion won in operating profit for the quarter. Samsung’s smartphone shipments and sales declined quarter-on-quarter amid the sluggish premium smartphone market, leading to the fall in sales and operating profit. Sales of its first-half flagship Galaxy S9 and S9+ models were slow, the company said. According to industry estimates, shipments of the flagship models had reached less than 19.2 million units for the past two quarters, and the official sales volume could be lower than that. Including the S9 series, the total sales volume of all Samsung phones officially recorded 78 million units for the April-June period, according to the earnings call. Samsung’s semiconductor business achieved strong results despite weak seasonality, posting 21.99 trillion won in sales and 11.61 trillion won in operating profit for the quarter. Both NAND and DRAM sales remained high owing to robust growth in demand on the back of the trend toward higher density for smartphones, SSD for servers and expansion of data center infrastructure. As the demand growth is forecast to remain strong in the second half, Samsung predicts the bit growth rates of the memory chips to hover around the middle of the 10 percent range. The annual bit growth is projectd to surpass 40 percent. Samsung’s foundry business is aiming to break $10 billion in annual sales by the end of the year with a goal of more than doubling its customer base by 2021. The consumer electronics division, including the visual display and digital appliances businesses, posted 10.4 trillion won in sales and 510 billion won in operating profit for the second quarter. Both sales and operating profit in consumer electronics inched up from a year earlier due a boost in the earnings of the TV business, including strong sales of its premium QLED TV and ultra-large screen TVs.